It is inactive yeast made from beet molasses and sugarcane. Nutritional yeast is often a strain of Saccharomyces cerevisiae, which has yeast cells that use sugar for energy. There are also many nutritional yeast benefits for your health. For instance, it is able to preserve immune function; improve digestion; promote healthy hair, nails, and skin; and reduce cholesterol and blood pressure. It also contains antibacterial and antiviral properties. Vegans and vegetarians value nutritional yeast, also known as nooch, savory yeast, yeshi, and hippie dust, for its nutrition and vitamin B content; however, most people can appreciate it for its nutty, savory, and cheesy flavor. As a result, nutritional yeast can be used as a cheese substitute in sauces, dressings, and even on kale chips. In this article, we will further explain the health benefits of nutritional yeast. 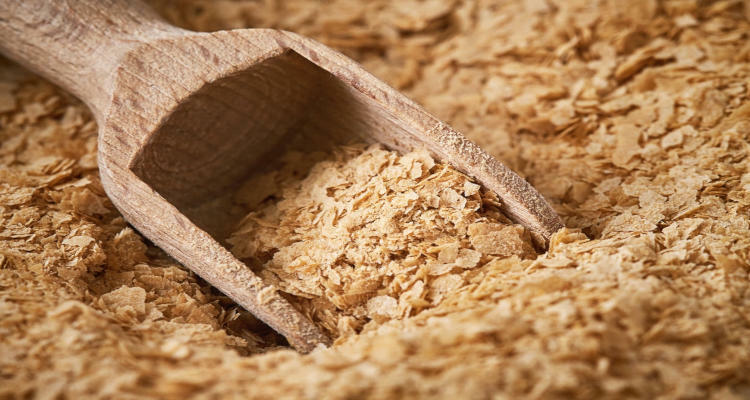 We’ll also examine the characteristics of nutritional yeast vs. brewer’s yeast, as well as the nutritional yeast nutrition facts, uses, and potential side effects. It is important to note the difference between brewer’s yeast and nutritional yeast. Brewer’s yeast is the by-product of beer-making. It has a tiny, single-celled look, while nutritional yeast is more of a flakey or powdery yeast. While the yeasts share the same family of S. cerevisiae, nutritional yeast is considerably superior to brewer’s yeast when it comes to nutritional content. Nutritional yeast is much higher in B-complex vitamins. Nutritional yeast is also grown from sugar beets or sugarcane, and brewer’s yeast is often made from malted barley. In addition, brewer’s yeast has a bitter taste, and it may even have a beer-like aftertaste. Nutritional yeast, on the other hand, is, again, known for its savory, nutty, and cheesy flavor. Both nutritional yeast and brewer’s yeast are considered inactive yeasts, and this means they won’t make bread rise like the active dry yeast used for baking. Both yeasts can be used in sauces, soups, and smoothies. Nutritional yeast is also a common cheese substitute, and can be sprinkled on pasta or over popcorn or kale chips. Is nutritional yeast good for you? Nutritional yeast is loaded with nutrition, and is a good source of B vitamins for vegans and vegetarians. Two tablespoons of nutritional yeast contain an incredibly high amount of vitamin B1, vitamin B2, vitamin B3, vitamin B6, vitamin B12, and folate, as well as some vitamin B5. It is important to note that B vitamins are only found in fortified nutritional yeast. Non-nutritional yeast is also available; however, for optimal benefits, it is best to blend both fortified and non-fortified nutritional yeast. This yeast is also a good source of protein and fiber. From a mineral perspective, nutritional yeast contains copper, iron, zinc, manganese, and magnesium. The following is a comprehensive nutritional yeast nutrition chart with information for two tablespoons, or 16 g, of fortified nutritional yeast. What Are the Nutritional Yeast Benefits? Nutritional yeast is a complete protein source and contains nine of the 18 amino acids that the body does not produce. This is good for vegetarians and vegans who struggle to get enough protein in their diet. A protein deficiency can lead to a sluggish metabolism; trouble building muscle mass; low energy and fatigue; poor concentration and trouble learning; blood sugar changes; joint, muscle, and bone pain; and mood changes. As we noted, nutritional yeast also contains high levels of B vitamins, including vitamin B1—also called thiamine. Vitamin B1, when used in combination with other B vitamins, can help regulate digestion, endocrine, and cardiovascular function. Is there a connection between nutritional yeast and candida? Candida is a fungal infection that can lead to brain fog, bad breath, exhaustion, cravings for sweets, digestive problems, chronic sinus and allergy issues, joint pain, and hormonal imbalance. Nutritional yeast is considered one of the better remedies for these chronic candida symptoms. Some research suggests that nutritional yeast also improves digestion; boosts immunity; lowers blood pressure and cholesterol; and promotes healthy nails, hair, and skin. We will explore these nutritional yeast benefits below. The antibacterial and antiviral properties in nutritional yeast have been found to be effective against salmonella, E. coli (Escherichia coli), and staphylococcus. Immune-boosting compounds in nutritional yeast include glutathione, mannan, trehalose, and beta-1,3 glucan. Research shows that adding beta-glucan and alpha-mannan to animal feed decreases the frequency of infections from salmonella and E. coli in pigs. Alpha-mannan and beta-glucan may also protect against infection by stimulating immune cells and stopping pathogenic bacteria from infecting the intestines. Many of the nutrients in nutritional yeast also prevent nutrient deficiencies, and this is helpful for tissue repair and wound healing. The B vitamins in nutritional yeast are very beneficial for healthy nails, hair, and skin. The vitamin B3 in nutritional yeast, for example, can treat chronic acne and improve skin overall. The biotin and vitamin B5 in nutritional yeast can benefit healthy nails, skin, and hair, while also reducing signs of aging like skin spots and red skin. Nutritional yeast has also been found to be useful for those with diarrhea, as well as a poor appetite. Nutritional yeast also contains probiotics, which have been found to benefit diarrheal patients. Nutritional yeast is also a good food for people with lactose intolerance. This is because nutritional yeast has a cheesy flavor and can be used to replace dairy or cheese in certain meals. Research suggests that S. cerevisiae expresses sucrase and isomaltase activity, but not lactase activity. This means that nutritional yeast may improve malabsorption in patients with sucrase-isomaltase deficiency who intentionally or unintentionally consume sucrose. The beta-glucan in nutritional yeast is known to lower both cholesterol and blood pressure. One eight-week study found that men with high cholesterol who consumed 15 g of beta-glucan from yeast daily reduced their total cholesterol levels by six percent. Another study published in the Journal of Immunotoxicology in 2009 found that mice fed beta-glucan from yeast had significantly reduced levels of cholesterol after just 10 days. Beta-glucan is also found in other foods, including seaweed and oats. Research shows that the beta-glucan in oats can significantly reduce oxidative stress, cholesterol, and diastolic and systolic blood pressure levels. Although the chemical structure of beta-glucan in oats is slightly different than the beta-glucan structure in yeast, research suggests they have similar cholesterol-reducing effects. Vitamin B12 deficiency is common in vegans and vegetarians. A poor vitamin B12 intake can lead to chronic fatigue; poor memory; joint pain; trouble breathing; muscle aches and weakness; poor dental health; depression; anxiety; heart palpitations; and digestive problems like diarrhea, nausea, and cramping. Since vitamin B12 is only found naturally in animal products, nutritional yeast consumption can help vegans and vegetarians avoid a deficiency. A study published in the journal Annals of Nutrition and Metabolism in 2000 found that consumption of one tablespoon of fortified nutritional yeast daily helped restore vitamin B12 levels in vegans who were deficient. For the study, the nutritional yeast contained five micrograms of vitamin B12 per tablespoon. This is more than double the recommended daily amount for adults. Nutritional yeast can be found in bulk or in the supplement section of a health food store. When properly stored, nutritional yeast can last up to two years. There are many nutritional yeast uses and ways to add these powdery yellow flakes to your diet. For instance, nutritional yeast adds a taste similar to parmesan to popcorn, pasta, and kale chips. You can also use nutritional yeast as an ingredient for healthy chips such as sweet potato, beet, or zucchini chips. It blends well with cashews to make a creamy cheese sauce as well. Nutritional yeast can also be added to mashed potatoes or baked potatoes. And it provides soups with a slightly creamier and thicker texture. The yeast also adds a salty and nutty flavor to basil pesto, and can be added to smoothies, scrambled eggs or tofu, and salad dressings. In most recipes, the typical serving size for nutritional yeast is one to six tablespoons. Are There Any Side Effects of Nutritional Yeast? Are there any nutritional yeast dangers or side effects to consider? Most people will not have a problem with the yeast; however, in high amounts, there are potential nutritional yeast risks. Nutritional yeast is safe to use in moderation, which can be up to several tablespoons daily. It would take relatively large amounts to lead to a nutritional yeast overdose, which would exceed the tolerable upper intake levels of the various minerals and vitamins in nutritional yeast. In some cases, high doses of nutritional yeast have caused uncomfortable facial flushing. Are there any specific nutritional yeast side effects? People allergic to yeast should certainly avoid nutritional yeast. And whether or not you are allergic to yeast, whenever trying a new food, you should begin with small amounts to see how your body reacts. It is also important to note that nutritional yeast does not contribute to candida yeast infections. Completely deactivated and pasteurized nutritional yeast is safe, and it does not lead to overgrowth of yeast. Nutritional yeast is not your typical yeast. It is inactive yeast made from sugarcane and molasses, and therefore will not cause yeast infections or candida symptoms. On the other hand, there are many nutritional yeast benefits. It is loaded with B vitamins, including vitamin B12, which makes it a good food option for vegans and vegetarians. Nutritional yeast also contains high amounts of vitamin B1, vitamin B2, vitamin B3, vitamin B6, and folate. Nutritional yeast is also considered quite beneficial for the immune system; digestion; skin, nail, and hair health; and reducing cholesterol and blood pressure. As a result, nutritional yeast is a great addition to a healthy diet, and can be used in a number of ways. Nutritional yeast is often used as a cheese substitute, and it can make a delicious cheese sauce. It is also great in kale chips, pesto sauce, potatoes, smoothies, salad dressings, tofu, eggs, and more. “Nutritional Yeast Flakes (Kal) 2 Tablespoons Nutrition Facts & Calories,” SELFNutritionData; https://nutritiondata.self.com/facts/custom/1323565/2, last accessed September 8, 2018. “Nutritional Yeast: The Antiviral, Antibacterial Immune-Booster,” Dr. Axe; https://draxe.com/nutritional-yeast/, last accessed September 8, 2018. Cespedes, A., “What Is the Difference Between Brewer’s Yeast & Nutritional Yeast?” Livestrong, October 3, 2017; https://www.livestrong.com/article/176197-what-is-the-difference-between-brewers-yeast-nutritional-yeast/, last accessed September 8, 2018. Julson, E., “Why Is Nutritional Yeast Good for You?” Healthline, Nov. 30, 2017; https://www.healthline.com/nutrition/nutritional-yeast, last accessed September 8, 2018. Kogan, G., “Role of yeast cell wall polysaccharides in pig nutrition and health protection,” Livestock Science, May 15, 2007, 109(1-3), 161-165, doi: 10.1016/j.livsci.2007.01.134. “Weird Myths and the Real Truth About Nutritional Yeast,” Kimberly Snyder; https://kimberlysnyder.com/blog/2014/09/08/inconvenient-truth-nutritional-yeast/, last accessed September 10, 2018. Muhammad Imran Bashir, K., et al., “Clinical and Physiological Perspectives of Beta-Glucans: The Past, Present, and Future,” International Journal of Molecular Sciences, Sept. 2017; 18(9): 1906, doi: 10.3390/ijms18091906. Bashir, K., et al., “Clinical and Physiological Perspectives of Beta-Glucans: The Past, Present, and Future,” International Journal of Molecular Science, Sept. 2017; 18(9), doi: 10.3390/ijms18091906. Vetvicka, V., et al., “Effects of yeast-derived beta-glucans on blood cholesterol and macrophage functionality,” Journal of Immunotoxicology, March 2009; 6(1): 30-35, doi: 10.1080/15476910806204317. Donaldson, M., “metabolic vitamin b12 status on a mostly raw vegan diet with follow-up using tablets, nutritional yeast, or probiotic supplements,” Annals of Nutrition & Metabolism, 2000; 44(5-6): 229-234, doi: 10.1159/000046689. Taylor, M., “Seven Surprising Ways to Use Nutritional Yeast,” Prevention, May 17, 2015; https://www.prevention.com/food-nutrition/healthy-eating/a20457179/nutritional-yeast/, last accessed September 10, 2018. “Are there risks from eating too much nutritional yeast?” Veganism & Vegetarianism beta; https://vegetarianism.stackexchange.com/questions/1389/are-there-risks-from-eating-too-much-nutritional-yeast, last accessed September 10, 2018.